Raining A Deficit – Is California Headed Into A Drought? Is California Headed Into A Drought? 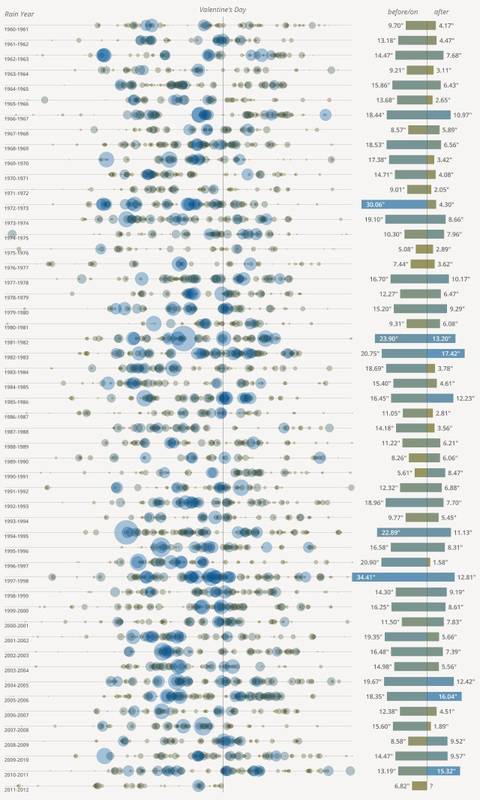 That’s a line per rain year – the period running from July 1st through the following June, centered on California’s wet winter months – with a circle for each day sized by the amount of precipitation. The bars show the total rainfall received on either side of Valentine’s Day for each year. To enhance readability, smaller amounts are tinted “dead grass” brown and larger amounts “pooling water” blue. The data comes from meteorologist Jan Null’s Golden Gate Weather site, with updates from the NWS monthly summaries. On average, downtown San Francisco gets about 22.0 inches of annual rainfall: roughly two thirds (14.8″) on or before February 14th and the remainder (7.2″) after. This season thus far, the City has received 6.8 inches, about 46% of normal for the date, ranking as the third driest pre-Valentine’s period on record since 1960, behind 1975-76 and 1990-91. As for our March Miracle? Check the chart, and you’ll find that the years which finished wettest share one thing in common: none started out unusually dry. Furthermore, the ten seasons with the driest beginnings averaged 8.1 inches before V-Day and a paltry 5.2 inches after, which suggests that when the last raindrop falls, the 2011-12 rain year will clock in at around half of normal. “Don’t call a drought!” implore my skis and lawn. And perhaps rightfully so. At any moment, Mother Nature could deliver a duck-drowning deluge of Noachian proportions. However, the numbers suggest the opposite scenario, wherein the coastal Californian might be wise to toodle over to the local Home Despot and get one of them new fangled home desalination units – while the gettin’s good!